My parents have been away this week. It's given me a lot of time to myself (although I did spend a fair chunk of it out of the house). I have this feeling that something is missing. Something in me. It's not that 'something missing' from before, ie. Becky, it's something else. It's that little thing that makes me feel good about being me. Now, today, I felt that little spark of 'living', if you will. I was up at the church at Whitby, dressed in my very first proper Cirquepunk outfit, playing with my Flowersticks. Since it's currently Goth Weekend, the place was full of photographers. Every so often, one would appear, ask me if they could take my photograph and whathaveyou. This had been going on all day, really, but just when I was walking around. Up at the church, though, while I was happily circusing just for the sheer fun of it, a whole herd of photographers started to circle me. My friends had counted them – I was in double figures with my photog-collecting. It was slightly unnerving, but at the same time, it felt amazing. All of these people watching me, wanting to capture my image for whatever reason. I've been to Whitby Goth Weekend plenty of times, but nothing like this has ever happened before. I had people complimenting my outfit, my makeup, my hat and so on. I think I'm starting to come out of my shell a bit. I think what sparked it was the summer. It was a massive confidence boost, I'll tell you that. After all that stuff about two years ago, with all the manipulation, fake-blame, lies and constant put-downs, having someone tell me I was, shall we say, crunchy seems to have lifted me out of my ongoing mental slump. For example, I don't think I could have ever gone out to Whitby looking like I did. I'd be far too paranoid of those people in the street, the faceless masses, the collective 'they'. I certainly wouldn't have danced around with my college friends at a Halloween party, gotten over-excited when the Time Warp came on, fell over, then cheered when the DJ made an announcement to everybody else that the floor was a bit slippy. Hell, it's a well-known fact that I don't dance. But, I digress. I felt the spark of 'living'. ps. On another note, Here's my newest vlog. I love The Birthday Massacre. That photo of Chibi there - A few times, she reached her hand towards me like that, only to slap my hand when I put mine forwards. I cried during Always. After that, she saw me while I was drying my eyes. I looked at her, she looked at me and we laughed. She just looked to cheerful through the whole gig. And she's so damn cute! Next time they tour the UK - ROAD TRIP! One gig was certainly not enough. Oh, what a fortnight I've had. I've not been so emotionally up and down in... what?.... a year and a half? I think I've done everything now, though, so I think I'm finished. I haven't really accomplished much today. 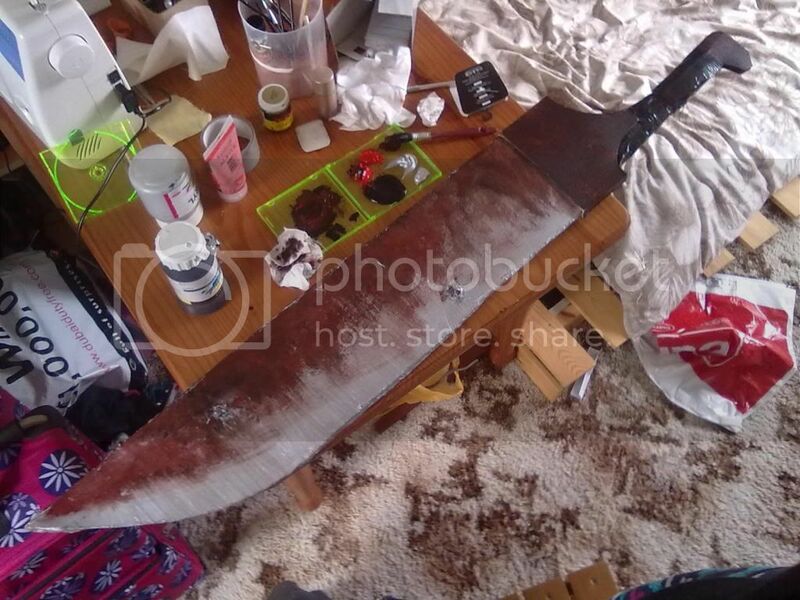 I haven't touched my college work, I've not done anything with my Pyramid Head costume or anything that even resembled effort. I bought a Macbook today. After at least 3 years of drooling over them, I gave in. I admit, I did hate the curvy look of the new Macbooks, but when I went down to PC World today, I just fell in love with it. Sod the curves. It's still a Macbook. I'm £910 down with the added 'Wolfey is stupid and will break her new plaything' cover, but, hell, it's worth it. That's my Top 25. My computer recently got reformatted and... well... 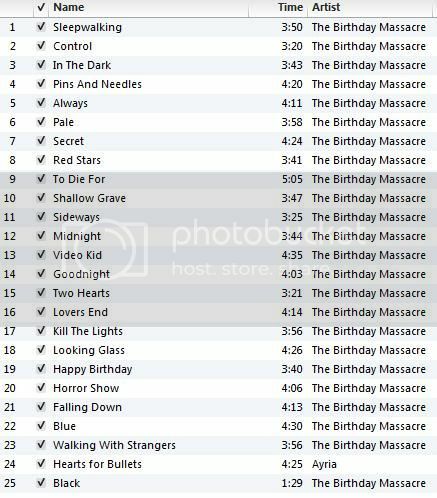 The Birthday Massacre are practically all I've listened to (with a wee bit of Ayria thrown in for good measure, of course.). In other news, I'm back for my second (or third, if you count Foundation) year at CCAD. Back to costume and prop making I go! Got a couple of nice looking projects this time - Design and make (but only make the whole thing if you want to) a Chinese Opera style costume based off a myth/legend and design/make a character for a children's television programme. I just know that second one will be fuelled by my injokes and doodles. And the first one? Well, that's just obvious.